If a newly HIV-infected person is fighting a virus that has already “pre-adapted” to their immune system, that has a strong influence on how quickly that person will progress to AIDS, a team of researchers led by scientists from Microsoft, UAB and Emory report. HIV is constantly mutating. That means the virus can, in effect, customize itself so that it is less visible to someone’s immune system. If a newly HIV-infected person is fighting a virus that has already “pre-adapted” to their immune system, that has a strong influence on how quickly that person will progress to AIDS, a team of researchers led by scientists from Microsoft Research, the University of Alabama at Birmingham and Emory University report. The results were published Monday, May 16 in Nature Medicine, and have implications for HIV vaccine design and how future vaccine studies should be conducted. The findings make the case for “conserved elements” vaccines, which target parts of the virus that don’t change as much. They also suggest that a “mosaic” vaccine approach that seeks to include many variants of the virus would be less likely to succeed, the researchers say. Hunter is a Georgia Research Alliance Eminent Scholar and co-director of the Emory Center for AIDS Research. Led by Hunter, Goepfert and Jonathan Carlson, PhD, senior researcher at Microsoft, the team built a new computer model of viral adaptation that includes human genes that frame the immune response to viral infection. They then “trained” the model using data from more than 4,000 HIV-infected study participants from around the world, and performed additional experiments with samples from recently infected individuals at the Alabama Vaccine Research Clinic. The project involved investigators from International AIDS Vaccine Initiative, Oxford University, Simon Fraser University, the University of Kwazulu Natal, the Ragon Institute of MGH, MIT and Harvard, Murdoch University, the B.C. Centre for Excellence in HIV/AIDS, Gilead Sciences, the Zambia-Emory HIV Research Project, and the La Jolla Institute of Allergy and Immunology. The machine learning model is available for other researchers to use at http://phylod.research.microsoft.com. The model found that adaptation of a person's virus is a strong indicator of their current disease status, as measured by viral load and CD4 counts, and predicts future changes in these markers, Carlson says. In the studies the team reviewed, individuals who had the misfortune of being infected by a pre-adapted virus progressed three times faster. The genes that have such a marked effect on HIV infection and progression are HLA genes, which are highly variable from person to person. They encode proteins that are present on many types of cells and display what’s inside cells to the immune system. The HLA proteins hold chewed-up bits of viral proteins, so that CD8+ T cells (an important arm of the immune system) can detect them and kill infected cells. In response, the virus mutates so that the bits of viral proteins don’t trigger immune alarms. 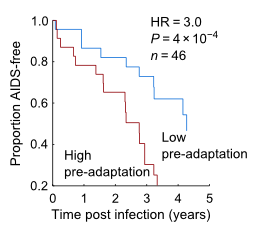 This process of viral adaptation is constantly occurring and some adaptations persist even after sequential transmissions to new individuals. HLA genes were already known to influence whether an infected person is likely to be an “elite controller,” for example. In addition, because they vary with geography, they affect the sequence of HIV that is most prevalent in different regions around the world. Future HIV vaccine studies have to take viral sequences and HIV genes into account, Carlson says in his explanation of the research on his Web page. While the rate of new HIV infections in the United States has decreased over the past decade to around 50,000 each year, there are still an estimated 2 million new infections each year around the world, despite the existence of effective antiviral drugs. Developing better prevention methods, including a vaccine, will be essential in decreasing or ending the number of cases of HIV infection, the researchers say. Hunter's research was supported by the National Institute of Allergy and Infectious Diseases (AI64060, AI050409). Full acknowledgements are available here.